As a kid growing up I have always been exposed to the outdoors, I spent most all of my time at my cottage either swimming or playing in the forest. Later on I became acquainted with skateboarding, which I spent a large portion of the past 10 years doing on a near daily basis. Attributed to my traveling, skateboarding has led me to New York on two occasions, California and Barcelona Spain where I spent two months in a rented apartment with friends. I also spent a month on my own traveling other parts of Europe. A fellow employee suggested becoming an arborist to me a few years ago. He said, “ It looks like so much fun, you literally climb trees for a living.” The following year, I did some research and it was seemingly right up my alley. I was already working with woody perennials, and smaller landscape trees with minimal knowledge of my impact. 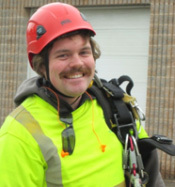 The desire to work in an environment that would both challenge me daily and allow me overcome fears, (much like skateboarding) became prevalent and I enrolled in the Humber College Arboriculture program in 2011. Working at Kelly’s Tree Care has been great; everyone I work with goes about his or her job in a safe, respectful and professional manner. KTC has offered a great amount of opportunity to advance myself within this industry and I hope to be improving upon myself as an arborist for a long time.